In previous posts, I have mentioned my undying love for both Quorn and Badia’s Louisiana Cajun seasoning blend. Now I am about to bring them together for the first time! It might be hard for you to find the Badia spices in your supermarket, so I would imagine any kind of blackening seasoning would work. However, if you can find this blend, use it! I know they don’t have Badia spices around here, so I grab them when I am visiting my in-laws in Long Island. Also, a note about Quorn: it is not vegan. As a vegan substitute, I think that firmly pressed tofu slices or tempeh would work, but I am not sure of how well it will turn out, because I haven’t tried it yet. Now, on to the frying! First, I heated up some olive oil in my cast iron skillet. I don’t know how much I used, honestly, but it was a little deep and just enough to coat the pan. I really need to start measuring. While that was heating up, I took about three tablespoons of olive oil and about three tablespoons of seasoning and mixed them up in a bowl. Next, I dipped the Quorn cutlets in the seasoning, making sure each cutlet was coated on all sides. 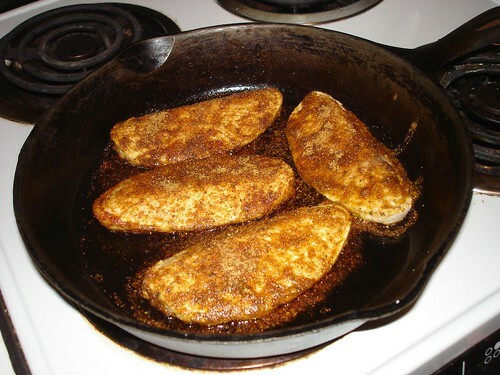 When all the cutlets are sufficiently coated, I dropped them into the frying pan and covered the pan with a lid. This makes the cutlets more juicy and helps the blackening of the spice. It also keeps grease from exploding all over my stove. I lifted the lid and flipped the cutlets a few times. When the cutlets begin to blacken, they are done. If you want melted cheese on your cutlets, now is the time to do so. The cheese melts nicely once you put the lid back on the frying pan. I made the cutlets into sandwiches, served on a sesame seed bun and topped with extra sharp cheddar, homegrown tomatoes from a co-worker’s garden (so good! 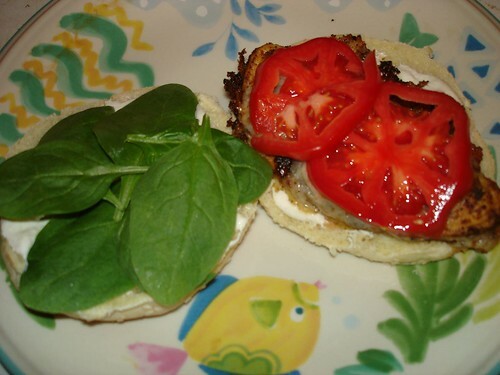 ), spinach, and a garlic horseradish creamy spread. Mix and let chill for 1/2 hour. A note on the creamy spread: I used sour cream because we had a little bit left that was languishing in the fridge. If I were to make this again, I would most definitely be using vegan mayo. I would also like to try this with fresh roasted garlic instead of the garlic powder. I think it would give the flavor more zing! Wow! Two posts in one week! I am on a roll. The next we meet, my friends, I will be telling you how to prepare a vegan Jamaican jerk eggplant wrap that is stuffed with beans and rice, carrots, and spinach. I still have leftovers from this meal and I am bringing it to work today. Very tasty. Until we meet again, have a great day and keep cooking! salt, ground red pepper, granulated garlic, basil, oregano, cumin, and coriander. They also spell Louisiana wrong too. That just aggravates me. I like those strips, but my grocery store doesn’t always have them. Also, I have never mastered the art of seitan. I love seitan.